Still holiday shopping? There are plenty of deals to grab out there including an 80GB PS3 for $323, a Philips Blu-ray Player for $199.99 shipped and a ScanDisk Sansa MP3 player for $25 shipped. • Lenovo IdeaPad S10 10.2" Netbook for $367 plus free shipping (going for $399. Use coupon code USPTS10). • Samsung 933BW 19" Widescreen LCD Monitor for $132.99 plus free shipping (going for $159.99. Use rebate form). • Canon PIXMA MP620 Photo All-In-One Inkjet Printer for $99.99 plus free shipping (going for $179.95). • Cavalry 1TB USB 2.0 3.5" External Hard Drive $99.99 (going for $129.99. Use rebate form). • Corsair Voyager 8GB Flash Drive for $9.99 plus free shipping (going for $19.99. Use rebate form). • Playstation 3 80GB Gaming Console for $323 plus free shipping (going for $399 - valid until 12/10. Use coupon code CTV2$2HX963145 for 15% and coupon code TP5NV0VMFJ9BCZ for 5% off). • PSP Slim 2000 for $137 plus free shipping (going for $169.99 - valid until 12/10. Use coupon code CTV2$2HX963145 for 15% and coupon code TP5NV0VMFJ9BCZ for 5% off). • Philips 10FF2CMI 10.2" LCD Digital Photo Frame for $99.99 plus free shipping (going for $139.99). • Philips BDP7200 Blu-Ray Player for $199.99 plus free shipping (going for $269 - valid until 12/8). • SanDisk Sansa E250 2GB MP3 Player for $24.99 plus free shipping (going for $52.35). • Canon VIXIA HF100 AVCHD 1080p SD Camcorder for $518 plus free shipping (going for $569. Use coupon code AFL5). • Lyon by Washburn Electric Guitar with 5 Watt Amp and Instructional DVD for $89.99 (going for $116.99 - valid today only). • Lyon by Washburn Acoustic Guitar with Instructional DVD for $49.99 (going for $99.99 - valid today only). 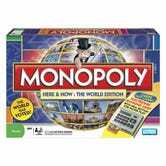 • Monopoly Here and Now World for $14.99 plus free shipping (going for $39.99 - valid today only).